News » Will Erin Hamlin shock the world with gold medal performance? Will Erin Hamlin shock the world with gold medal performance? Luge sledder Erin Hamlin will be entering the 2014 Winter Olympics as someone not expected to win the gold medal but her being overlooked is the best thing that could have happened to her. In 2010 she was the favorite to win the luge competition at the 2010 Vancouver Winter Olympics when the luge course officials had to change the race track to make it safer for all the competitors. The changes led to Erin Hamlin not being able to adapt and not placing in the race. She made no excuses but continued to work toward the 2014 Winter Olympics in Sochi for which she has qualified. The people of the United States love a comeback story especially those that involve an individual overcoming adversity to achieve success. Erin Hamlin is the type of outgoing individual whose unwillingness to complain make her someone that the television networks and sponsors will be aware of because she represents a great story to bring to the American audience. Erin Hamlin had Olympic glory and fame literally ripped away from her at the last moment and she never complained but instead brushed herself off and resumed pursuit of her goals. In her most recent World Cup race in Latvia she placed fourth and displayed the disappointment in that result that leads many luge insiders to believe that with some slight adjustments that an ex-World Champion such as Erin Hamlin can make it is very feasible that she can win an Olympic gold medal. The name Erin Hamlin may not be known to many in the United States outside of the luge community but her story makes her someone who after the Olympics would be a great motivational speaker and with the publicity she would receive from winning an Olympic medal, a very good candidate for a role as a television reporter. 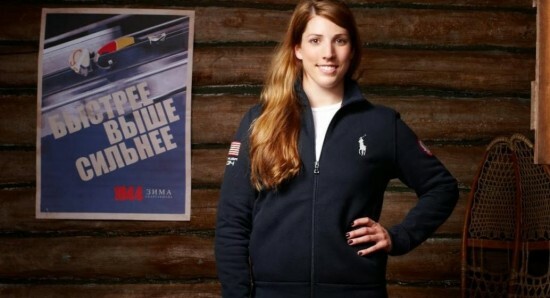 The American athlete who may be the surprise gold medal winner of the 2014 Winter Olympics in Sochi, Russia may be luge racer Erin Hamlin. Swiss skier Lara Gut propensity for changing what has worked with her team and equipment in order to get better is reminding fans of golfer Tiger Woods. Anastasija TItko is featured in Glamour Germany's October 2014 magazine and her stunning facial poses make her the star of the photo shoot. Ginta Lapina is enjoying an exceptional summer of modelling in 2014 as illustrated by her pictures for "Glass" magazine.